FINALLY! After weeks of tinkering, screaming and crying that Adam Schiff has never leaked to me, the Lid Radio Show has overcome the technical difficulties and returns. And we’re back with extra snark. 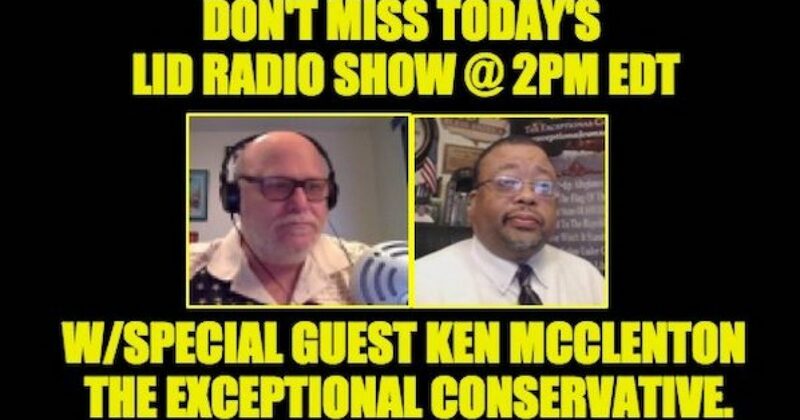 So listen to the Lid Radio Show today at 2pm EDT with our extraordinary guest and my good friend, Kenneth McClenton the Exceptional Conservative. There much happening, Brett Kavanaugh was nominated by the President to replace Anthony Kennedy, but now we’ve learned about his secret double life. Apparently, he sneaks out of his house with no one watching and joins his church in distributing food to the poor–Horrible! The DOJ and Bob Mueller indicted a dozen Russians for interfering with the election. And we’ve discovered collusion! No not between the Trump Campain and the Russkies, no one found anything on that, but between newspapers across America, And of course, there’s the President’s recent road trip to meet with NATO where some said the president insulted our allies because he demanded they keep their promises. Then to Helsinki and a meeting with Vlad Putin, where some Trump critics are accusing Trump of trying to overthrow the…well, trying to overthrow himself–it was beltway bloviating at its best. And along with being a media super-star, my exceptional conservative friend and his wife have developed an exceptionally important charitable effort. Three years ago their beloved daughter Charnice Milton was senselessly murdered, The killer was never found. Rather than wallow in the bitterness of losing a child, they decided to take action and practice what Jews call ‘Tikun Olam” repairing the world. In the name of their daughter Charnice Milton a DC Journalist, they created an organization called Open Heart Close Case (OHCC). OHCC is a not-for-profit group dedicated to Opening Hearts & Closing Unresolved Homicides, Missing Persons and Exploited Child Cases. It’s a great cause and if you wish to donate, go to the charity’s page and click on the Donate link.